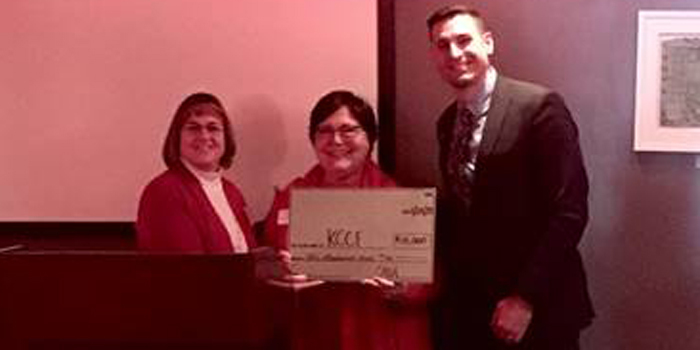 Pictured from left, are Mackenzie Cloutier, CASA executive director; Suzie Light, Kosciusko County Community Foundation CEO; and Jason Gergely, CASA board president. In October, Court Appointed Special Advocates was the second organization to successfully complete the fundraising portion of the challenge, raising $10,000 to receive $40,000 in matching funds for a total of $50,000 for their endowment fund. Because of the success they have had with the EC50 and other fundraising initiatives, CASA board members wanted to match the generosity of their donors. The board decided to continue the growth of the fund by giving another $10,000 to make a grand total of $60,000 for the endowment fund in 2018. The endowment fund provides CASA with a consistent annual stream of revenue. The principal is not spent. It is invested and the earnings from that investment support the work of CASA forever. “It was such a great opportunity to be part of the EC50 match, and we wanted to continue the growth of the fund and show our appreciation for our donors,” said CASA Executive Director Mackenzie Cloutier. Angie Ritchey, CASA board treasurer, was the individual who suggested the board’s contribution.